Paul Tennant is a Professor of Political Science at the University of British Columbia. Andrew Rettig is pursuing graduate studies in History at York University. John F. Hilliker is with the Historical Division of the Department of External Affairs. 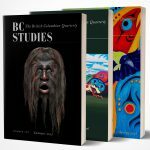 Douglas Cole is a member of the History Department at Simon Fraser University.